A local favorite if there ever was one. TownHall is known for its brunch selection, vast drink menu and the friendly laid back vibe. Located in the beloved Ohio City neighborhood of Cleveland, Townhall just down the street from The West Side Market, independent coffee shops and breweries. While it may have some competition within close proximity, Townhall still stands strong as one Cleveland’s most popular spots according to CL. Brunch is served every weekend from 9am – 2pm. The menu features some delectable choices like the “Southern Comfort” (Two buttermilk biscuits, house sausage gravy, poached egg, rosemary potatoes) for $9, the “Ohc Benedict” (Homemade buttermilk biscuits, two organic eggs, tomato, basil, hollandaise sauce, house sausage, rosemary potatoes) for $10, or the “Morning Glory Fork & Knife Burger” (8oz. Beef, organic spinach, organic egg, house made wheat english muffin, avocado, organic roasted corn, chorizo hollandaise, rosemary potatoes) for $14. 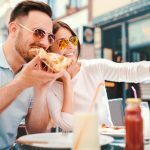 They also feature a Grilled Cheese Bar+Soup for $10 (+$2 for Avocado or Prosciutto) and a “Food Truck Tacos 2.0” section that offers build-your-own style tacos that range anywhere from $11 – $16. They do another build-your-own menu for crepes which come in at $8. On top of all that, they also offer a various assortment of salads like the “Harvest Salad” (Organic greens, townhall granola, thick-cut bacon, pear, candied walnuts, seared sweet potato, organic goat cheese) for $11 or the “Superfood Caesar” (Organic Kale and Swiss Chard, Chicken Chicharones, Grape Tomato, Kalamata Olives, Toasted Spiced Almonds, Organic Egg, Caesar Dressing) for $10. Many of these options are available on the full menu as well, so no need to just come for lunch if you need something more substantial! The drink menu is best known for its extensive beer options. Their menu currently features 36 beers of all kinds. They tend to update their beer selection quite often to keep things interesting, however if you have a favorite it may not always be available. Whether you’re in the mood for something average like “Miller High Life” or something a little more on the wild side like the “Peanut Butter Cup Coffee Porter” (brewed with 7 different malts then infused with peanut butter, chocolate and fresh roasted coffee) – there is always something new and intriguing to try. Another reason to make Townhall part of your regular routine is the fact that all of their beers are always $5. Granted, some beers will be $5 for 8 oz, and others will be $5 for a 12 oz, but either way you can still get an affordable drink here with ease. And if $5 isn’t affordable enough for you, stop in on Monday nights from 5 pm to close and get all your favorite beers for just $3 instead! 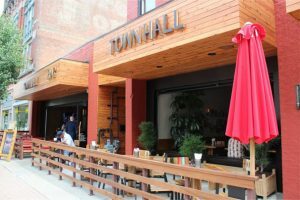 Overall, Townhall is a Clevelander favorite and won’t be disappearing any time soon. It’s a great place to meet up with friends and loved ones to just relax and have a great time without breaking the bank. Stop in at 1909 W 25th St Cleveland, OH 44113, call the restaurant at (216) 344-9400, or visit the website here. Check out the Best Restaurants in Cleveland Ohio. Mike & Abby Sweeney are our resident foodies. Their thought process on food is "to give everything a chance." Matt loves craft beers, Italian food, and any play on bar bites. Abby is into wine, cheese, and anything Asian. Together they form a dynamic duo eager to weigh in on any new restaurant!